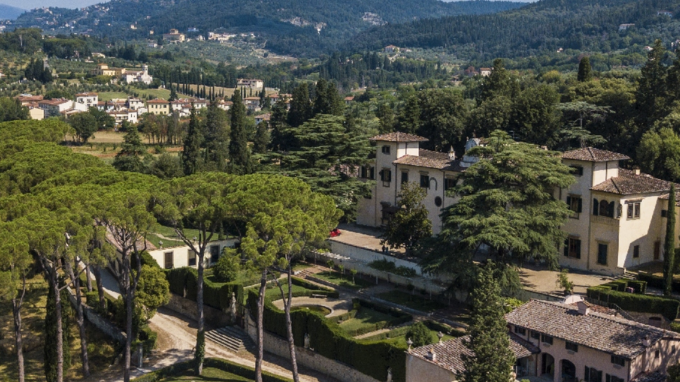 This spectacular villa for sale in Florence, in the heart of Tuscany, was built by an important Tuscan noble family, who bought it in the 13th century. This estate is surely one of the most charming villas one may find in Tuscany, and it has seen famous people such as the Strozzi family, who have left a lasting trace here: the symbol of the family are three crescent moons, which can be seen on floors, ceilings, stone fireplaces, and even on windows. The current owners restored this prestigious property in 2001, maintaining its charm and historical features. This villa measures 1,800 m2 and it is home to 25 residential units and a number of bathrooms and utility rooms. This luxurious villa also features two buildings, a farmhouse and an apartment. The independent apartment measures 270 m2 and is on one floor which can be accessed by walking through a charming courtyard. The villa itself is home to a bright living room, a dining room, a kitchen, and four en-suite bedrooms. This floor is also home to a wonderful terrace equipped with small tables and chairs and offering a lovely view of the surroundings. Opposite the main estate there are two majestic buildings: a lemon conservatory conversion and a farmhouse. The lemon conservatory has recently been refurbished with modern finishings while maintaining its original architectural details. The rooms are very elegant and feature majestic exposed beams, big windows letting abundant sunshine in throughout the year, and a wonderful main door that was once used when moving lemon trees. The apartment on the ground floor is home to an exclusive living area, a kitchen, four en-suite bedrooms and a laundry room. This estate is surrounded by a luxuriant garden measuring approximately 750 m2 and featuring a private car park. This property is completed by a fantastic two-storey farmhouse measuring 350 m2. The first floor is home to a bright living room with a lovely fireplace, a spare bathroom and some utility rooms. The upper floor is home to a living room with a wonderful 19th-century fireplace, three en-suite bedrooms and a spacious walk-in closet. This estate is framed by a fenced garden and a private car park. The whole property is surrounded by 12 ha of grounds, in a very quiet setting which is also close to the city centre. This stone farmhouse for sale is in San Casciano Val di Pesa, in a panoramic area with a unique view of Florence's hills.